"On Tuesday, November 4th, 2008 Barack Obama became the President-Elect of the United States of America. 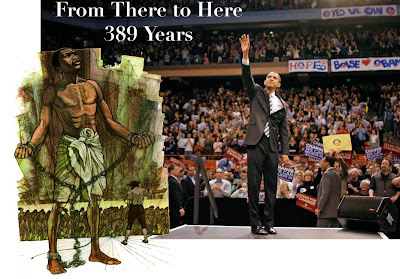 389 years earlier, the first slaves arrived on these shores. Congratulations Mr. Obama, and America for reaching this historic moment. This event marks a milestone that many thought would never come. The implications of which many others will ignore, or deny even exist. But just because you say it isn't so, doesn't mean it isn't so. We are moving into a new era... An era of equality. Equality not just concerning race, but concerning gender, and monitory status as well. History will remember this day as the beginning of our journey towards creating a world without hate, and without war. A world united against hunger, and poverty. A world committed to standing together to save this planet from ourselves. This is the day that we, America, stops saying to the rest of the world, "Respect us because we say so, because we are better than you. ", but instead declare, "Respect us because we are a part of you. You are a part of us. Because we are, once again, leading the way in the quest for what is best in all of us. Respect us, because we respect you." This is a moment in time that demands that we take pause, and ponder it's meaning. We must seize this moment, and proudly forge onward, together, into a future filled with freedom, and hope for all people."